I thought it might be of interest to announce that The Great Courses company just released a 12 hour video course by me on the subject of a Theory of Everything. It's a birds eye view of a vast field. When you finish, you'll have the big picture. Digging into the details will require a different resource. Note that it goes on sale periodically and you can typically get it for about $70 or $80. If you buy it, please comment on it here. * in fact, I live near a neutrino detector in the Black Hills of South Dakota and IIRC, Fermilab once fired a whole slew of very soft bullets in our direction. People here hardly felt a thing. Well, it's semi-spamming. But it really is pretty good. It's amazing what a good producer can do. Assuming my characterization of the very recent physics is more or less correct, do you foresee any kind of paradigmatic change in how this stuff will be thought about, how it will be taught, what different kinds of metaphor or translation will be used (i.e., different than the solar system image of particles orbiting a centre, etc.)? Has any kind of change happened already or do you think there will be change in the future? (I note that even our conception of DNA is as a bunch of balls linked together into the familiar double helix but even that now seems potentially antiquated and obsolete). Or is this covered in your lecture series? I am still rolling some of this around and don't want to get too bogged down with all of the technical details (so please overlook if I get some of this wrong) but I am aware that most people including me, when you translate some of this stuff, prefer to think in terms of discrete objects with clearly defined boundaries that help keep things in place. So I might be asked something about ancient Mayans, Romans or Paleoindians, etc., which could include something like is this a typical Mayan pyramid or piece of pottery, etc., and have to consider what is or how do you identify the boundary between Mayan vs. non Mayan pottery or pyramids (or US vs. Canadian politics or health care, etc.) even when at different levels such boundaries may be meaningless (to at least some). In your area of physics I suspect that most of your "meaning" comes from squiggles on a blackboard calibrated with machines that go beep, lights that flash and numbers on a computer screen. You only go to the solar system models to communicate with us knuckle draggers and the less bright physics undergrads until they learn to toss that aside for the squiggles on a blackboard. I may have picked up the odd little bit about the waves, etc., from Higgs Boson videos but when I go to a science center and compare the weights of equal size balls of lead vs iron or uranium I think in terms of discrete packages with a clear defined boundary containing the properties of colour, mass, hardness, etc., and thinking of those balls of metal as being without "particles" is quite a mental stretch and does not become intuitively obvious. Do you see this changing and how? What might be similar changes do to people's thinking higher up in the relevant intellectual fields (other than the wacky stuff having different directions to drift off into)? Models are good in a reason of applicability. Those ball and stick models of organic molecules have value. They are wrong in detail, mind you; but they have value. The solar system atom has value. Again, wrong. But there's a reason we teach it. At the deepest and most fundamental level, at least at the leading edge of knowledge, the smallest particles are localized vibrations...what used to be called wavicles. Essentially, they are quantized vibrations of fields. And, if you want the most modern paradigm, there are no solid things. Everything is vibrational energy. The different vibrating fields can talk to other vibrating fields, which is how an electron transfers energy to a photon and so forth. Mind you, those of us on the hairy edge of knowledge know that these models are themselves imperfect. What seem to be the smallest particles are actually probably a composite of smaller vibrations of constituent fields. And it may be that we will get to a size scale where we have to chuck these ideas for something else. Current thinking (and don't believe this) is that we will eventually find that the universe consists of quanta of space or time. And there are ideas where space and time are emergent properties from even more abstract ideas. So we don't know where we'll end up. But we can talk about the mindset of the current theories. This doesn't cover the wave nature, but does cover the idea of how we view atomic matter. I will be giving these a go, possibly tomorrow, so thanks. I knew the wave would come up but of course I visualize that in terms of water where my mind's eye sees the boundary of surface of water rising. In that model a thing with a defined boundary. Vibrations I can get but again it is someTHING that vibrates. Even air is rationalized in my mind as molecules, being tiny objects, vibrating (although I have difficulty imagining a case where the ground is not also vibrating). While sure I can also see translating and stepping beyond those kinds of models and metaphors I have to admit that I also wonder to what extent we are hard-wired, perhaps by biophysics to some degree, to require some conception of solid, bounded objects. And I wonder what will happen if someone over the next 10 or 100 years does come up with a real paradigmatic shift in how this stuff is conceptualized. Perhaps I focused on the wrong facets of your question. Regarding boundaries, it's easy to think of examples that are a little less cut and dried. For instance. What is the boundary of the Earth? It's tempting to think of the Earth's surface, but there is also the atmosphere. And, as you know, the atmosphere grows less dense with altitude. You can't draw a boundary, except arbitrarily. Maybe another option is the idea of atoms as a solar system. Where does the solar system end? The Kuiper belt? The Oort cloud? And then when? You could imagine the heliopause, but that is arbitrary too. If you look at solar systems from the point of view of the galaxy, each solar system can be imagined as a point, yet as one gets closer, each of them gain fuzzier boundaries. On the scale of the universe, each galaxy can be thought of as a point...or at least a ball. In this image, each little dot is a galaxy (and big dots are clusters of galaxies). Yet we know of each galaxy as an object with an ill defined boundary. 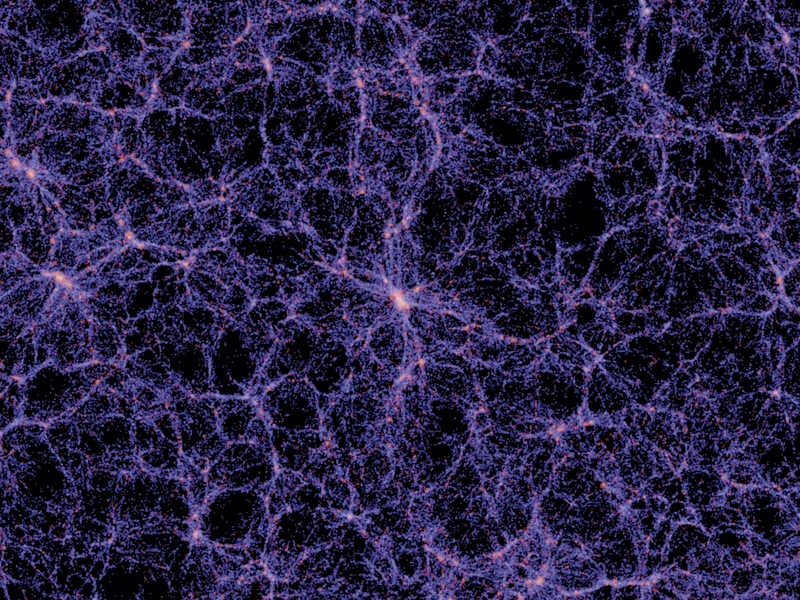 And even at these large scales, we see filaments, nexuses and voids. In short, the idea of little hard objects with boundaries is really wrong all levels of the universe. Even the smoothest mirror has surface imperfections that are small. Note here that I avoided all of the wave thing. That's an entirely different kettle of fish. Last edited by hyksos on November 22nd, 2017, 7:12 am, edited 1 time in total. Lincoln » March 8th, 2017, 7:30 am wrote: Models are good in a reason of applicability. Those ball and stick models of organic molecules have value. They are wrong in detail, mind you; but they have value. Sort of. It's a model with some applicability. But electrons are most certainly not orbiting the nucleus. Take a look at the Schroedinger orbitals shapes. They aren't planetary-like in nature. How many levels below Quarks are these smaller vibrations of constituent field? It does beg the question, What is the cause or components of the vibrating constituent fields? Could it be the fundamentals of matter/energy is going to be conjunctive variable of time and energy creating that which matter is ultimately built of? At some point, be it quark bits or smaller, matter must become less tangible and less physically identifiable, and more ethereal, and whimsical. Sounds like fields of bits of energies forming temporarily in time and coagulating at the right frequencies to form the various particles of the fundamental matter. Lincoln » March 7th, 2017, 10:30 pm wrote: What seem to be the smallest particles are actually probably a composite of smaller vibrations of constituent fields. No. I judge this to be very unlikely. String theory works well enough to show this. All the fundamental particles look like the vibrational modes of strings/branes. Even if M/string theory is ultimately incorrect, this strongly suggests that the one thing we should not expect is that these fundamental particles are composite. And that is not the only reason. We have reach the point where pulling the particles (quarks) away from each other requires enough energy to create more partlcles (quarks). That I believe is another strong indicator that we have reach the end of reductionism in physics. Lincoln » March 7th, 2017, 10:30 pm wrote: Current thinking (and don't believe this) is that we will eventually find that the universe consists of quanta of space or time. If you mean it is all pointing towards a purely geometric theory, where the fundamental particles are the vibrational modes of space-time itself, then yes I think that is exactly where this is all headed and whether you believe in it or not is hardly relevant. But what could possibly be your problem with this, I cannot imagine. Last edited by mitchellmckain on November 23rd, 2017, 6:49 pm, edited 2 times in total. We don't know how many levels of structure there are below quarks. There may be but one, or there may be many. I'd bet on many, but I wouldn't bet much. The short answer is nobody knows and anybody who makes confident assertions on this topic is either a fool or a liar. The characteristic scale of superstrings is of order 10-35 meters, while the smallest thing we can currently resolve is of order 5 x 10-20 meters. Round numbers, that's 15 orders of magnitude. That's the difference between the size of a proton and you. Think about how many different structures occur over that particular range of scales. It seems highly improbable that nothing happens between the minimum current size measurement and the Planck/string scale. This isn't to say that we know that strings aren't the final answer. We actually know precisely zero about this, but it might be true. But I would bet that there are a few levels of matter between quarks and strings. And the issue with the energy of removing two mutually-interacting quarks is a red herring. This is a consequence of the nature of the binding force and not sizes. QCD is an abelian (e.g. self interaction) theory/force, while non-abelian theories (e.g. electromagnetism) don't experience this phenomenon. Lincoln » November 23rd, 2017, 11:33 pm wrote: We don't know how many levels of structure there are below quarks. There may be but one, or there may be many. I'd bet on many, but I wouldn't bet much. The short answer is nobody knows and anybody who makes confident assertions on this topic is either a fool or a liar. We can suppose anything. We can suppose the universe began yesterday with all our memories the way they are. The question is whether we have one single reason to suppose the thing? Do we have one single reason to believe that electrons and quarks are composite? We do not. Lincoln » November 23rd, 2017, 11:33 pm wrote: The characteristic scale of superstrings is of order 10-35 meters, while the smallest thing we can currently resolve is of order 5 x 10-20 meters. Round numbers, that's 15 orders of magnitude. That's the difference between the size of a proton and you. Think about how many different structures occur over that particular range of scales. It seems highly improbable that nothing happens between the minimum current size measurement and the Planck/string scale. Yes and 10-35 meters is infinitely bigger than point particles, which is what electrons and other fundamental particles look like as far as we can tell. Lincoln » November 23rd, 2017, 11:33 pm wrote: This isn't to say that we know that strings aren't the final answer. No, we do not know either way. Supersymmetry in particular may be wrong and without this the outlook for string theory as we currently understand it is a bit dim. It is looking a lot like we are missing a big piece of the puzzle. Lincoln » November 23rd, 2017, 11:33 pm wrote: We actually know precisely zero about this, but it might be true. That we do not know if string theory is correct does not mean we know nothing. It does not mean string theory tells us nothing about these fundamental particles. And seeing all the fundamental particles line up as the vibrational modes of strings does not look like a coincidence. It has fundamental rather than composite written all over it, at least it does to me. Lincoln » November 23rd, 2017, 11:33 pm wrote: But I would bet that there are a few levels of matter between quarks and strings. And I would not. I think that is a poor bet. More physics beyond the Standard Model? Yeah I would bet on that one. But not levels of matter smaller than electrons and "quarks." I would not bet on something for which we have no evidence whatsoever. Furthermore, it makes me uncomfortable how much this looks like rooting around in the refuse pile of old ideas and trying to use them again. I think it is more likely that if we will find the answer then it will be based on completely new ideas never considered before. Lincoln » November 23rd, 2017, 11:33 pm wrote: And the issue with the energy of removing two mutually-interacting quarks is a red herring. This is a consequence of the nature of the binding force and not sizes. QCD is an abelian (e.g. self interaction) theory/force, while non-abelian theories (e.g. electromagnetism) don't experience this phenomenon. This is true and yet the problem with this is that it looks like an excuse for why we should say quarks even exist when the fact is that we cannot get them alone. When we pull a proton apart, we do not get quarks. That is a fact. So my point is that we have reached a point where even saying that things like protons and pions are composed of quarks has a different meaning -- a little bit more abstract than what we meant by this before with atoms composed of protons, neutrons and electrons. So in opposition to your "levels of matter between quarks and strings" supposition I propose an alternative which I see as being just as possible if not more so. This is that we have already gone too far and invented "levels of matter" that are not even real but simply artifacts of our mathematical representations and useful tools for explanation but not things which actually exist an any substantial way. Notice that I am not actually proposing this. In other places I defend the theory of quarks. But this still looks just as possible to me as your "levels of matter between quarks and strings" idea. Quarks are real. I discovered one of them in 1995. (Well, me and 800 of my closest friends.) And there is really no doubt about the existence of quarks. Although the person who proposed them (Gell Man) thought of them as a mathematical constructs, the experimental community established that they exist in the 1970s. The fact that protons consisted of something predates that by at least a decade. And the discovery of the gluon in 1979 bolstered the theory of QCD to the point where it is not argued by any expert. There absolutely IS reason to presuppose a substructure to quarks and leptons and that is called the flavor problem or generation problem. Hell, even the idea of superstrings presupposes a substructure, at least in a manner of speaking. In any event, the experimental community thinks the substructure hypothesis to be of sufficient merit as to explore it. Hundreds of papers have been published using Tevatron and LHC data on the hypothesis, including many dozens which I co-authored. These are in respected journals such as Physical Review Letters and Physics Letters B. I even wrote a cover article in Scientific American on the subject in 2012. The preon idea is not well regarded by the community, but it is a credible one. Nobody...even me...should believe that quarks and leptons have substructure. There is zero experimental evidence for that hypothesis to be correct. However, the Standard Model is sufficiently robust that there is very little experimental evidence for any extension. That's why the research community is rummaging around in the data looking for clues. The one possible real clue is in the g-2 data and we'll get a better handle on that in 2020 when it starts taking data for real. And, at least for me, the clues inherent in the existence of three generations of matter is compelling enough for me to spend my research time looking into that, rather than other attractive questions. I looked you up...the internet is good for that sort of thing. Congratulations on your book. Have you considered using a publisher for future efforts rather than self-publishing? Your paper of 2000 seemed reasonable. I presume that this was your MA work? Your coauthor continues to generate an ongoing body of work. I was unable to find any additional published work of yours to better evaluate your credentials. So glad you kids found each other. My stay here will be brief. I wouldn't have seen it except that the "auto notify" told me someone posted on this thread. Lincoln » November 24th, 2017, 9:16 am wrote: Quarks are real. I discovered one of them in 1995. (Well, me and 800 of my closest friends.) And there is really no doubt about the existence of quarks. Although the person who proposed them (Gell Man) thought of them as a mathematical constructs, the experimental community established that they exist in the 1970s. The fact that protons consisted of something predates that by at least a decade. And the discovery of the gluon in 1979 bolstered the theory of QCD to the point where it is not argued by any expert. Congratulations on that. I am sure it would have been quite thrilling to be in on that. But, I am pretty sure I understand how such discoveries work and what I was suggesting that it is possible in the case of the quarks to explain these away to some degree. But again, I am not seriously proposing this, just comparing what I saw as one wild speculation with another. Lincoln » November 24th, 2017, 9:16 am wrote: There absolutely IS reason to presuppose a substructure to quarks and leptons and that is called the flavor problem or generation problem. Hell, even the idea of superstrings presupposes a substructure, at least in a manner of speaking. In any event, the experimental community thinks the substructure hypothesis to be of sufficient merit as to explore it. Hundreds of papers have been published using Tevatron and LHC data on the hypothesis, including many dozens which I co-authored. These are in respected journals such as Physical Review Letters and Physics Letters B. I even wrote a cover article in Scientific American on the subject in 2012. The preon idea is not well regarded by the community, but it is a credible one. My first inclination here was to surrender and say the generation problem is good evidence. However... frequency modes also have higher energy counterparts without being composite, so I am still not betting on more substructure. Lincoln » November 24th, 2017, 9:16 am wrote: Nobody...even me...should believe that quarks and leptons have substructure. There is zero experimental evidence for that hypothesis to be correct. However, the Standard Model is sufficiently robust that there is very little experimental evidence for any extension. That's why the research community is rummaging around in the data looking for clues. The one possible real clue is in the g-2 data and we'll get a better handle on that in 2020 when it starts taking data for real. And, at least for me, the clues inherent in the existence of three generations of matter is compelling enough for me to spend my research time looking into that, rather than other attractive questions. Since this seems to contradict the previous paragraph I suspected a typo. I would not have drawn so fine a line between presupposing and believing, but maybe what you meant is we have good reason for speculation but no evidence for a conclusion. But I would say that no evidence for an extension of the Standard Model means that the breakthrough is going to requires looking at the problem in a vastly different manner like when Einstein recast gravity in terms of geometry in GR. Lincoln » November 24th, 2017, 9:16 am wrote: I looked you up...the internet is good for that sort of thing. Congratulations on your book. Have you considered using a publisher for future efforts rather than self-publishing? Things like publishing fictional novels can be very difficult without support from other people, more so these days when there is so being produced. I wrote three science fictions books and that was the easy part -- hell, it was fun. I put one out there to see if it interested anyone, but I am not much of a salesman. Lincoln » November 24th, 2017, 9:16 am wrote: Your paper of 2000 seemed reasonable. I presume that this was your MA work? Your coauthor continues to generate an ongoing body of work. I was unable to find any additional published work of yours to better evaluate your credentials. I worked with Carelton Detar on the Nambu Jona Lasinio model for a few years doing simulations on a multiprocessing supercomputer. But my interest dissipated until I left the field of theoretical physics and academia to pursue other things. And now I have moved on yet again. It was fun to be part of the top quark discovery. I don't think it was my favorite advance. Probably the Higgs boson back in 2012 was more interesting. The downside is it took a lot more people. But we got far more attention for that. The higher modes of vibrations of superstrings is a compact explanation of many of the issue of quarks vs. leptons and the generations, plus issues of bosons and fermions. There is no doubt about that. Personally, I like it very much. I hope it's true. But I don't believe it,, even though there are some who hold fast to th idea. On the other hand, despite going on 40 years of work, there is no prospect of testing the hypothesis. Until such a possibility exists, it's all so much smoke. It beggars my imagination that over the 15 orders of magnitude of size scales between current quark/lepton size limits and the Planck scale that we won't find something else. When I think of the ubiquity and plethora of structures going from the human (meter) to proton (femtometer) scale, I just think it highly unlikely that it's quarks and leptons and then nothing until strings. Could be, but I'll bet it isn't. There are plenty of ongoing mysteries, from dark matter and energy to the matter/antimatter asymmetry to something as mundane as the quadratic divergences in the Higgs mass. I predict that all of them will eventually manifest solutions at energy scales far below the Planck scale. In fact, we hope that they will be solved at energy scales only one or two orders of magnitude beyond current state of the art. Detar's work on lattice QCD is known and perfectly reasonable. Can't say I know him personally, although I did see his plenary back at the January APS meeting this year. Of the UT profs, I knew Lynn Higgs best, but he's been gone for two years now. Lincoln » November 24th, 2017, 5:16 pm wrote: There are plenty of ongoing mysteries, from dark matter and energy to the matter/antimatter asymmetry to something as mundane as the quadratic divergences in the Higgs mass. I predict that all of them will eventually manifest solutions at energy scales far below the Planck scale. In fact, we hope that they will be solved at energy scales only one or two orders of magnitude beyond current state of the art. I can appreciate that kind of subjective reasoning even if I don't fully share it. My own dislike of the idea of more substructure is no less subjective. I don't know how seriously to take dark energy or even dark matter. Frankly they look just a little bit like Ptolemy's epicycles to me. But then, I suppose they could be said to represent the black holes of the next generation -- I don't know of any physicists who doubt the existence of black holes anymore. One day we may see something more substantial regarding dark matter or dark energy, but at this point I remain skeptical even though far more than a hundred papers were produced on those subjects. Lincoln » November 24th, 2017, 5:16 pm wrote: Detar's work on lattice QCD is known and perfectly reasonable. Can't say I know him personally, although I did see his plenary back at the January APS meeting this year. Of the UT profs, I knew Lynn Higgs best, but he's been gone for two years now. I knew Lynn Higgs mostly as a department administrator rather than someone involved in actual physics (i.e. either teaching or research). Well the underpinning data of dark matter and energy are both real. Galaxies really do spin too fast. There will be an explanation. As I have said, I don't claim that quark and lepton substructure is established. It isn't. But when you are working on the frontier of knowledge, you have to pick on some unknown to pursue. That one is mine. It could be dark matter or energy or any of a number of other things. The sociology of the respective sub-disciplines is one of the factors guiding my decision and, I must admit, I had hoped that the advent of the LHC would advance our knowledge in a positive way, but no luck. I may have to turn to ultra-precise measurements instead, along the lines of g-2 or Mu2e. Lynn had an education mission and it is through that passion that I met him. We worked together for a week every summer for something like a decade. If you get to the apparently fundamental level, at whatever level that turns out to be, is it reasonable to surmise based on current theory, that the composite structure will be held together by a force? Assuming yes, is it further consistent to see this force with a duality to both bind the structure, and also to manifest as that same structure, not unlike the particle wave duality? I guess I don't understand the question. Superstrings is a possible, if improbable, final answer. So if that satisfies your criteria, yes. Sorry, I wasn't thinking of string theory at all. Furthest from my mind. I'm thinking of the point where structure becomes, from nothing? Not unlike a photon, on the one hand the photon has structure, but on the other hand it can be thought of as a wave of probability depending on obseravation. So this nothing but a wave of probability becomes something of structure in the photon. Something from the nothing? So with that thought in mind, I'm thinking of a binding force as a field of probability acting to bind the base structure, while at the same time having that same structure as an aspect of that same probability field? Again, this is nothing but a field of probability, but it becomes something of structure depending on the observation. Something from nothing? Is there any matter/energy from nothing in current thinking, or this just counting fairies? For every theorized or discovered component particle there arises the question, "And what is that thing made of?" Are there any thoughts on how to get nothing to populate the Universe with matter and energy? You should probably read Feynman's "QED." I have. I'll dig it out and have another read of it. The OP unfortunately just touched on some current working theories about particulate matter in the video blurb. In the 1940s at my school, an atom was regarded as the smallest particle of matter, and the working theory at that time was that it consisted of electrons orbiting a nucleus of protons and neutrons in a solar system model, as others have mentioned. I can get my head around the fact that these particles are now regarded as vibrating energy foci and they may or may not be rotating and that some can exhibit duality. I have a problem with dark energy. It seems to me to have been invented purely to balance the energy books of the universe. The thing I really have trouble in getting my head around and which I believe requires much more investigation if we are looking for a theory of everything is the ether itself. It makes up by volume far more of everything as I can conceptualise it, than everything else in the universe put together. In his 1909 book “The Ether of Space”, Sir Oliver Lodge said “To show that the ether cannot be the slight and rarefied substance which at one time, and indeed until quite lately, it was thought to be, it is useful to remember that not only has it to be the vehicle of light and the medium of all electric and magnetic influence, but also that it has to transmit the tremendous forces of gravitation.” (See http://www.gutenberg.org/files/40911/40 ... 0911-h.htm ). He went on to state that that ether had a fourth dimension – time – and that somehow this time property allows for the ether (or space) to curve or bend. Something is missing to my mind in our understanding of the properties of this ether. I can understand the difficulties in studying it, simply because it is all-pervading in our universe. It constitutes the main volume of every atom everywhere. Therefore there is no stable yardstick by which to measure its properties. Does the concept of Minkowski Space NOW always override the concept of Euclidean Space, and are there any schools of Physics researching Euclidean ether/space? Ether doesn't exist. Stop reading articles from over 100 years ago. It's like you posting on the politics of the Romanov court. Minkowski space overrides Euclidean space. Always. And malleable space time overrides Minkowski. There are no schools researching ether and Euclidean, because we've known that it is dead, wrong, and utterly forgettable for over 100 years.